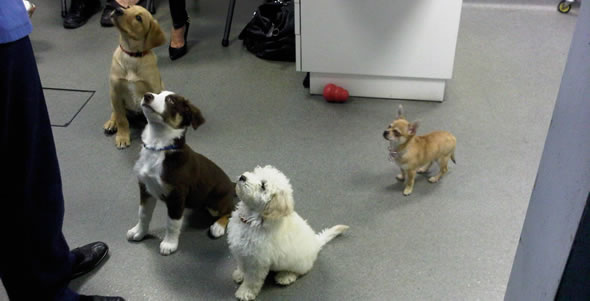 Our puppy classes have been running since 1999 and have proved to be a great success. There are huge benefits to puppies and owners, which can be seen throughout the puppies’ lives. • ensure the puppies enjoy themselves, so they are keen to return time and time again! Puppies are allowed to run free and encouraged to play together under close supervision. There is a guided tour of Prospect House. The parties run over three weeks with a maximum of 8 puppies. The cost for the course is £15 with party bags included. (10% discount for puppy package clients).